Motion-triggered cameras are a fixture in wildlife studies these days, helping scientists keep an eye on target species ranging from clouded leopards to dholes. But sometimes, if you leave a camera out to do its thing, you end up with something unexpected. This was the case recently in the Czech Republic, where a camera survey captured the furry face of a golden jackal – the first living one ever recorded in the country. In Europe, golden jackals (also called common jackals) are found mainly in places like Turkey, Greece and the Balkans. The species suffered declines due to human activity during the early 1900s, but lately, its been reclaiming old stomping grounds – and even expanding into brand new territories, including the Czech Republic. In 2015, Klára Pyšková of Charles University and the Czech Academy of Sciences in Prague set up cameras to investigate the carnivorous wildlife of central Bohemia, about 40 kilometres east of Prague. 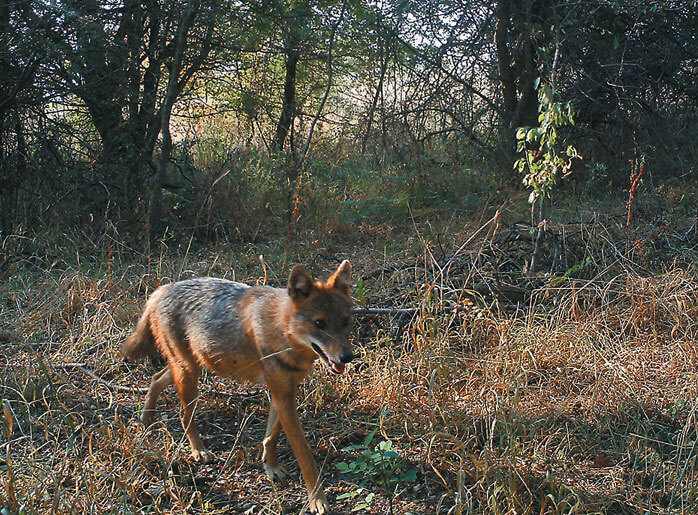 The first shot of the jackal came in June 2015, and over the next year, the same animal was photographed more than 50 times, usually in the early morning or late evening. Reports of golden jackals in the Czech Republic go back to the late 1990s, but in all the previous cases, the animals had been shot and killed, hit by cars, or allegedly spotted and never verified. This particular jackal is the first of its species to be seen enjoying long-term residence in the country, even sticking around through the winter. "The habitat where the golden jackal decided to settle resembles the landscapes which these animals prefer in their natural distribution area, the Balkans – an open grass-shrubland surrounded by a forest," Pyšková said in a press release. Wandering across new borders is becoming something of a habit for these jackals. Over the last few decades, they've begun to appear in Austria, Hungary, Germany and elsewhere. The first report from Poland came last year, and early 2016 saw the first sighting in the Netherlands. The jackals appear to be expanding their home range to the north and west. Exactly why these animals are on the move is still unclear. "[T]here are several factors that have likely facilitated the spread, including indirect human influence," says Pyšková. She points out that warming temperatures may be allowing the species to inhabit new areas, though so far this is difficult to say with certainty. "Other suggested factors are human-caused changes in the overall character of landscapes, [and] the lack of natural predators, particularly wolves." Wolves have been wiped out from much of Europe by humans. New territories to explore may be great news for the jackals, but the spread of this species brings up some tricky questions for their human neighbours. Jackals are omnivorous, and will happily go after plant crops as well as small livestock. Besides that, they can carry diseases like rabies. If the jackals cause trouble, can countries treat these newcomers as an invasive species? Conservationists say no. "Invasive species [by definition] are those that have been intentionally or unintentionally brought to a new area by humans – this is not the case of the golden jackal here," explains Pyšková. Following environmental regulations, non-invasive wildlife must be treated with consideration – it cannot simply be eradicated as so many native species have been in the past, including European wolves (which are now finally making a comeback). The question of what to do with range-expanding species is not limited to the jackals. Plants, insects and spiders have all been observed moving into new European territories, likely as a result of rising temperatures. Others, like the jewel beetle, seem to be spreading out by exploiting the impacts of invasive species. As we humans continue to change the environment around us, it seems, we may need to learn to live with some new neighbours. This jackal proves the smaller underdog can win the day with enough cunning determination. 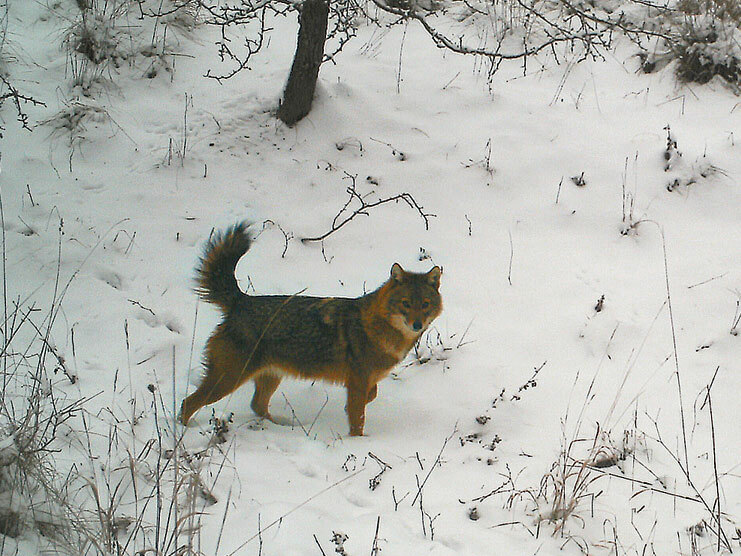 What happens when a lynx meets a wolf in the snowy Polish wilderness? A little skirmish between a dog and a cat is nothing to write home about. But a snowy standoff between a wolf and a lynx? We're listening. This shark has an appetite for … grass?